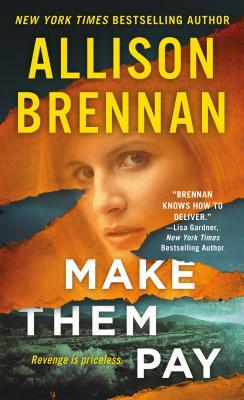 In Allison Brennan's Make Them Pay, Lucy Kincaid and Sean Rogan are finally tying the knot. Two weeks before their wedding, a surprise visitor shows up at their door: Eden, Sean’s estranged sister from Europe. She claims she’s in town for the wedding and wants to mend fences. Lucy invites Eden to stay with them—after all, family is family—but her boss, SSA Noah Armstrong, knows far more about Eden’s sketchy past than he’s let on.